In the first half of October 2018, a high pressure system settled down over Eastern Europe and brought excellent propagation conditions in Poland. Again, the summer-like weather brought sunny days and 20-25 °C temperatures. This time I logged some networks from Ukraine, Lithuania and almost… 3600 other from Poland. First signs of 5 GHz tropo came up around 18 UTC on October 10, 2018. I detected dozens of networks within 320° and 350° azimuth at distances of about 200 km (mostly Northern Poland near Gdansk). The reception from this direction lasted for one hour and then almost all signals faded away. Besides this, I also observed the development of a typical radiation inversion, which was bending the trajectories of some signals out of line of sight (typically below 100 km). Just before 21 UTC, the opposite direction moved on, mostly at an azimuth of around 130° with distances of around 250 km. Clearly, this was an elevated tropospheric duct which brought Lublin and the surrounding areas to my location. As time was passing, the signals were intensifying and more networks were logged. The forecasts were really great, so I was hoping for… Ukraine, but it was just a wishful thinking. My antenna was automatically rotating within the specified azimuth range, but from time to time I was checking what is going on. At some point, I noticed a network ripa1 with an odd radio name repehiv-ap1.rs. It was definitely not a Polish language, so I quickly rotated the antenna back at the reception azimuth – 135°. Meanwhile, I also googled for the repehiv word and found a village in Ukraine. This was even not a location close to the Poland–Ukraine border, but a significantly farther one. As usually, the best ducting conditions occurred along the lines of equal pressure level (1028 hPa MSLP). Well, I did beat my previous record by 100 km at once, reaching 464 km (to the point indicated by Wigle database) or 467 km (to the Repehiv village center). This network uses MikroTik hardware with 2×2 MIMO radio, configured in 802.11 mode on 5320 MHz. The exact location of this network is unknown, therefore the presented terrain profile was generated to the peak elevation in the vicinity of the point indicated by Wigle (in a distance of 3 km). 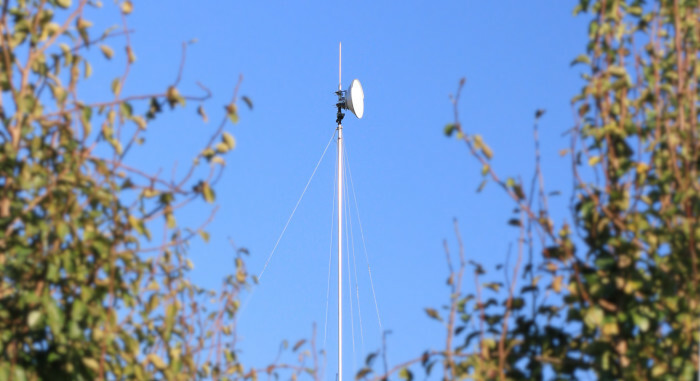 To achieve the direct line-of-sight, both antennas should be installed at a height of around 3.5 km. We do not take Earth’s curvature into consideration for tropospheric ducting propagation though. I also logged another network from Ukraine with s1:vZamok.ub1 radio name. It uses Ubiquiti hardware with 2×2 MIMO radio, configured in airMAX mode on a 5560 MHz (HT40+). This was a pretty straightforward riddle, as I know a place called Vysokyi Zamok (High Castle), so I identified it immediately. This is the highest point in Lviv, with Radio and TV Tower and a perfect view to the city. Once again, I confirmed my suspicions using the Wigle database. The distance to this location is 426 km. Shortly, the network’s SSID sc_neo_zb_link_01 was revealed. Unfortunately, the signal reception from Ukraine lasted only 10 minutes. This was my first reception ever from this country on the 5 GHz band. The following list contains the identified networks from Ukraine. According to the forecasts, I was in the middle of the strongest ducting area… and that was true. Good propagation continued throughout the whole night, but the obtained distances were shorter. Ukraine did not reappear though. The tropo area was extending from southern to northern Poland. In the morning another milestone was reached. Several minutes after 6 UTC I noticed a network name in… Lithuanian language called erdves_varniai_rm5_01. Unfortunately, this one was not available in Wigle database, but I found a village called Varniai at an azimuth of 25°, which perfectly matched my reception. The distance from my location is 390 km. This network uses Ubiquiti hardware with 2×2 MIMO radio, configured in airMAX mode on 5180 MHz (HT40+). Another network from Lithuania came in almost 20 minutes later. The name alma (Alma link AKKC) did not indicated anything special at first sight, but I found it in Wigle database and this is Alytus at 349 km. The AKKC capitals from radio name correspond likely to Alytaus kultūros ir komunikacijos centras (Alytus Culture and Communication Centre). This network uses Ubiquiti hardware with SISO (1×1 MIMO) radio, configured in airMAX mode on 5500 MHz (HT40+). A bit later I also logged few networks from Klaipėda. The following video presents scanning during antenna rotation. The first network MEZON_pajuris (GRL_BSUU_pajur) appears at 0 min 15 s (06:36 UTC / 08:36 LT). This one is based on Ubiquiti hardware with 2×2 MIMO radio, configured in airMAX mode on 5180 MHz (HT40+). The distance is around 363 km and the reception lasted for 40 minutes (between first and last log). Initially I thought I also logged MEZON-Z.Gorka from Lithuania, but this was just a coincidence. There is an internet service provider having the same name in Olsztyn, Poland. Another network r1_s15_8A (Rocket M5 Tita) can be seen at 1 min 56 sec (06:38 UTC / 08:38 LT). This one is based on Ubiquiti hardware with 2×2 MIMO radio, configured in airMAX mode on 5180 MHz. I also checked the FM radio band (87.5 – 108 MHz). Klaipėda reached a remarkable signal level, up to 58 dBf (-62 dBm) on LRT Radijas – 102.8 MHz. The last logged network and then identified from Lithuania, Kretingalė was r1_s30_2 (Rocket 5AC Prism) at a distance of 373 km. It uses Ubiquiti hardware with 2×2 MIMO radio, configured in airMAX AC PTMP Mixed mode on 5560 MHz. In the morning I also observed many networks from southern and south-eastern Poland at distances of over 300-350 km (incl. the vicinity of Kraków and Bielsko-Biała, but also Bilgoraj, Tarnogród, Zamość, Hrubieszów). Tropo weakened and greatly shortened around noon. The following figure presents successive maps during the tropo development at evening, night and morning. Cumulative network list (logged since 2015) is available there: https://wifi.fmdx.pl/ (see also the map). 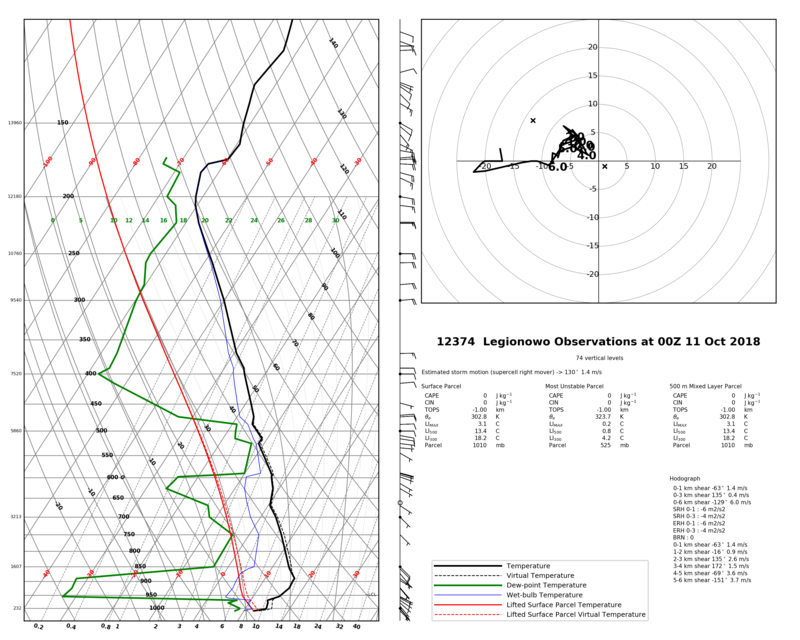 The atmospheric sounding is available from Legionowo near Warsaw (80 km away from my location). Both radiation and subsidence inversion layers ale perfectly visible. 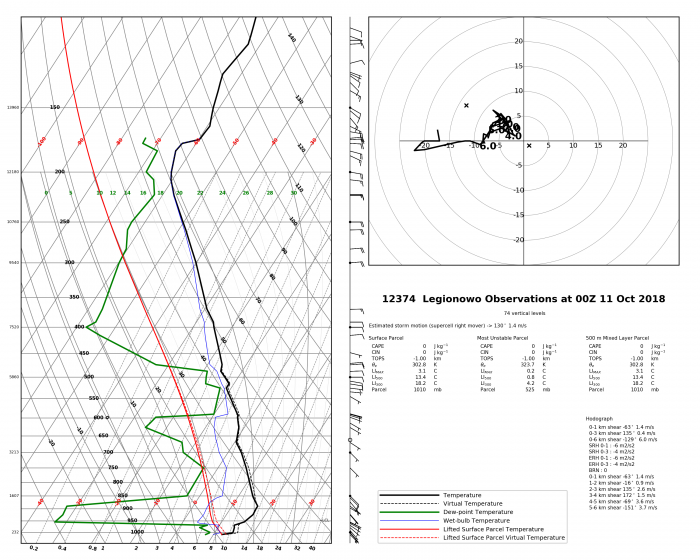 The cooler and moist air layer was trapped underneath a very dry (see the dewpoint temperature curve) and warmer air forming an elevated tropospheric duct.